Pointy on one end, blunt on the other, the European Starling. A silhouette of starlings, perched on a wire over a busy street. Why do they like the busiest streets? Is this Cedar Waxwing singing, or screaming at the top of its lungs? Big flocks of Cedar Waxwings are still here in Sewall’s Point. Shouldn’t they be heading north by now? Human snowbirds are pretty much gone. Traffic is blessedly light. Cedar Waxwings are easier to hear than see, unless they are moving across the sky from the tops of one big tree to another. When they are not eating tree fruit/ berries, they perch close together and hang out, not moving too much. A Museum of Wax(wings), get it? Solo or in small flocks, White Ibis are ubiquitous. This one was standing on a tree limb across the street from our driveway, keeping a big blue eye on the lady with the camera. This entry was posted in Uncategorized and tagged Cedar Waxwing, European Starling, White Ibis on May 1, 2018 by Amy. 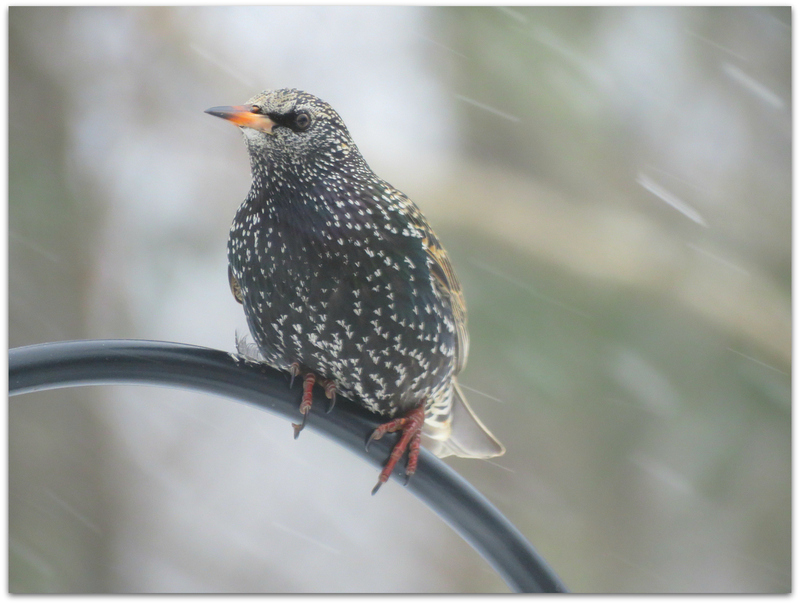 A solo starling has been visiting feeders off and on all day today. 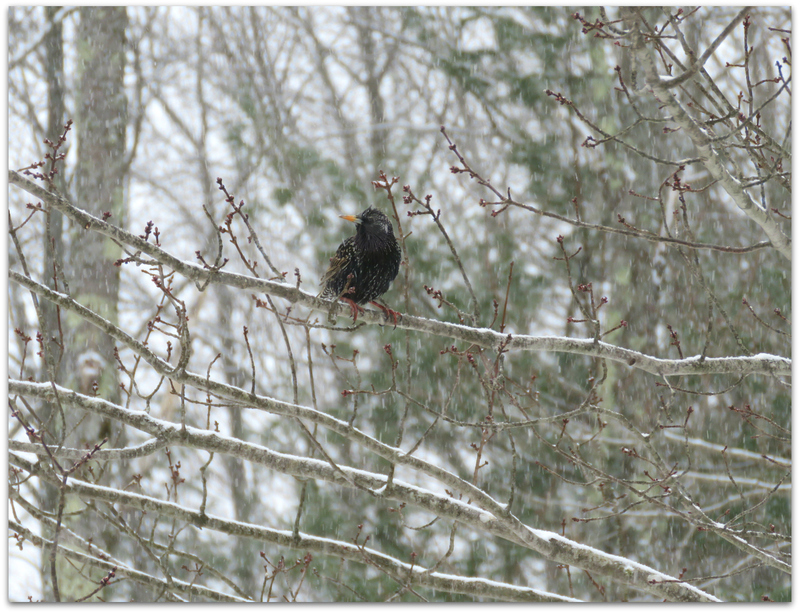 Hope he’s not the advance scout for the starling army that hangs around on nearby commercial Route 1! 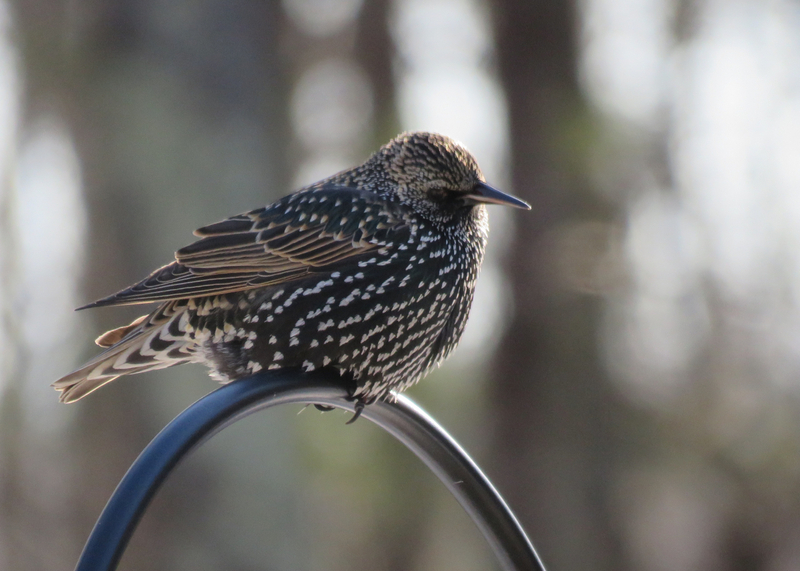 This entry was posted in Uncategorized and tagged birds, European Starling on January 13, 2016 by Amy. This is the maple tree next to our house and deck and bird feeders that is the birds’ most popular perching spot pre- and post-feeding. 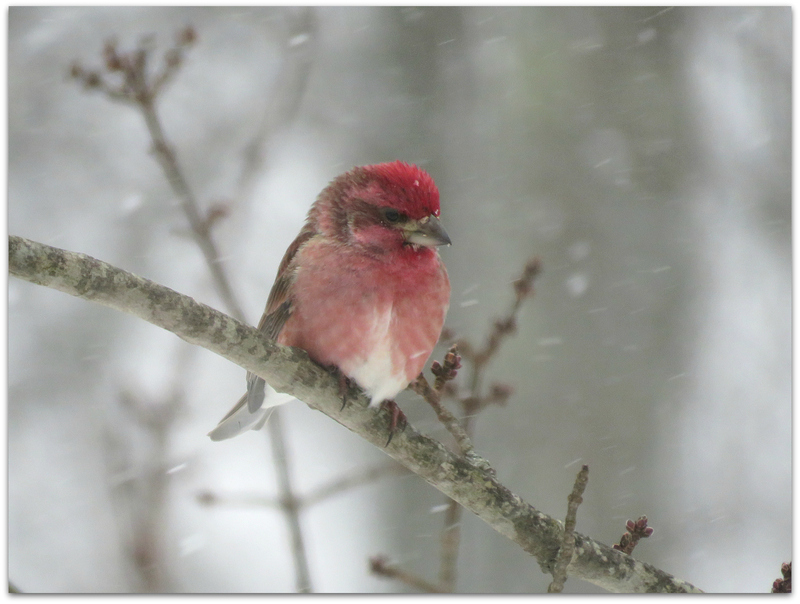 The snow is wet and spring-like on this, the first full day of spring. 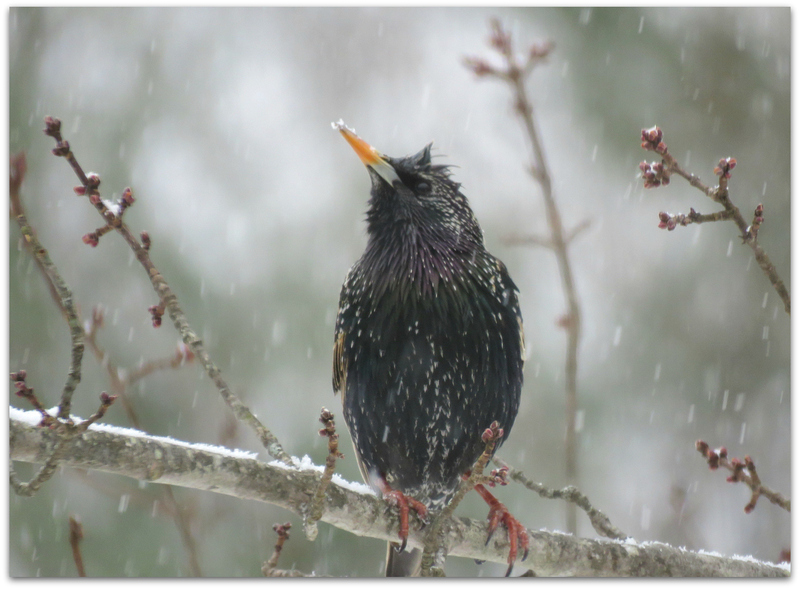 This entry was posted in Uncategorized and tagged European Starling, spring snow on March 21, 2015 by Amy. 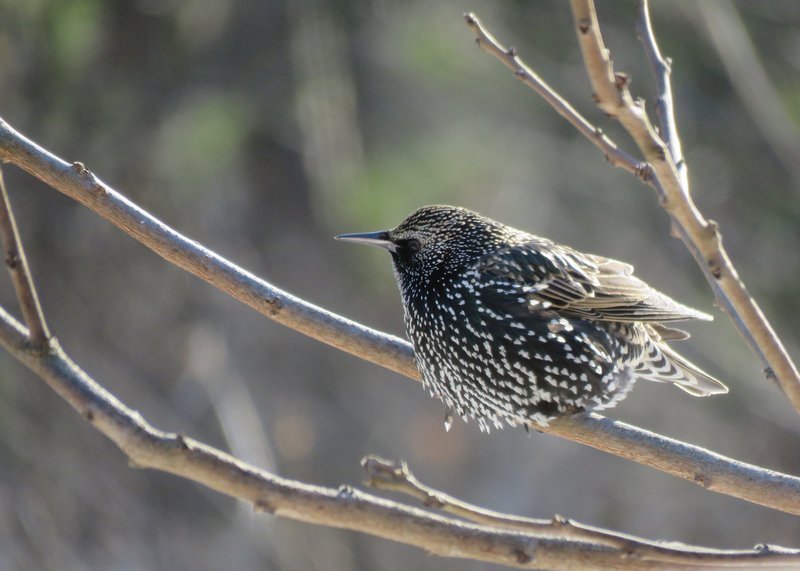 This entry was posted in Uncategorized and tagged European Starling on February 17, 2015 by Amy. 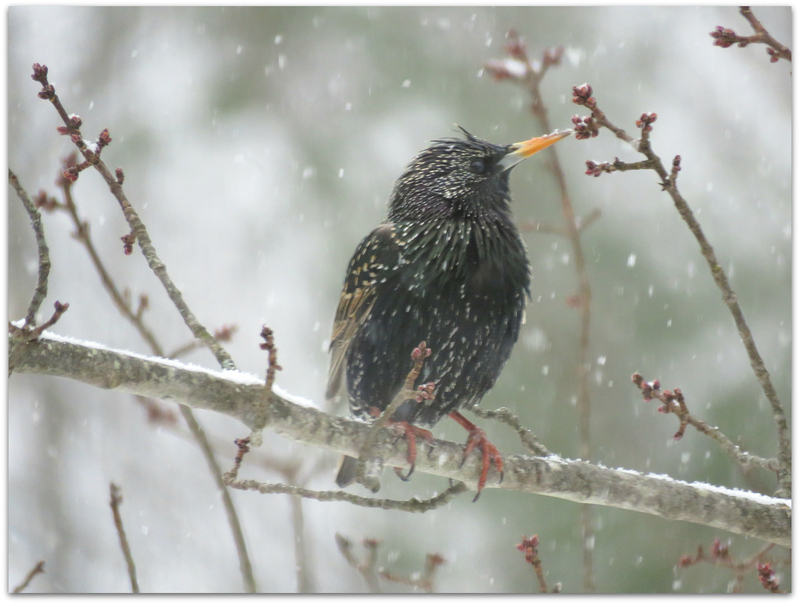 Fact #1: This is the first starling we have ever seen in our immediate backyard. 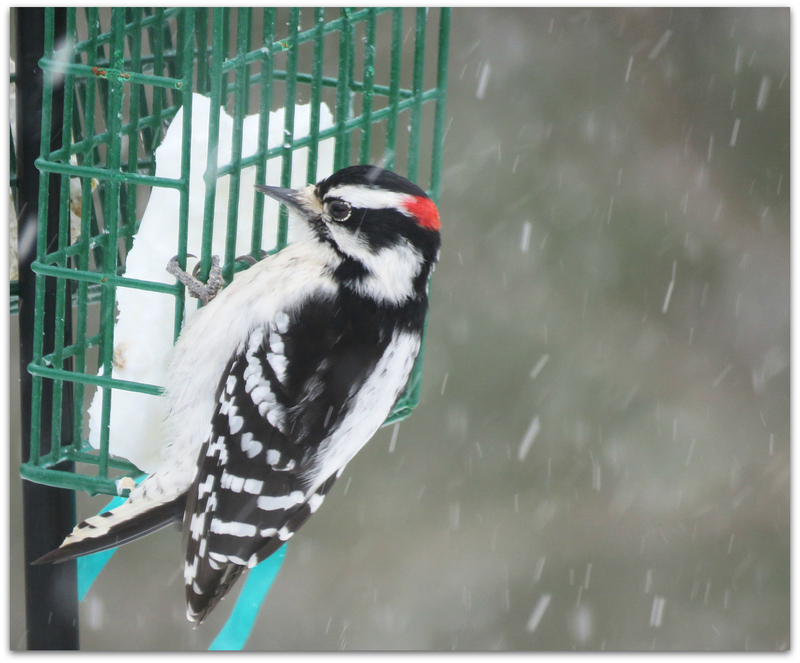 It visited the feeders, preferring the homemade suet dough in the dome feeder. Pretty feathers! Reminds me of a speckled hen. 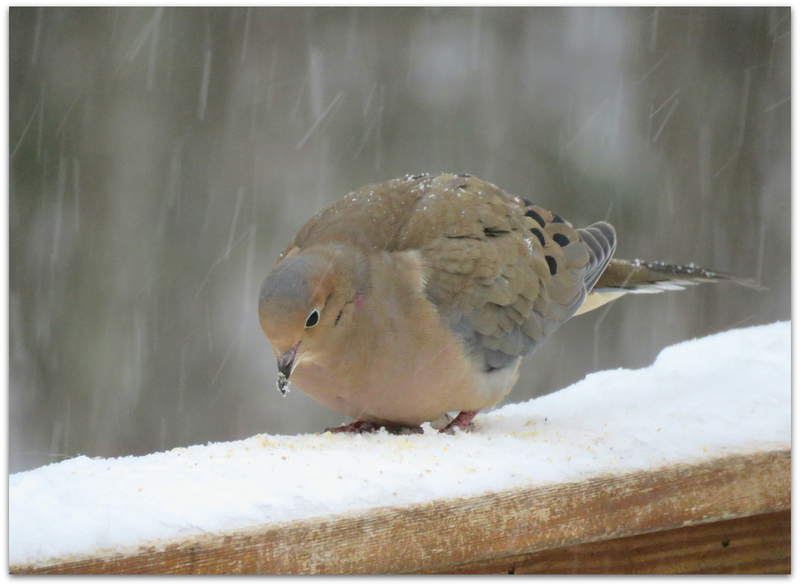 This one is fluffed up to keep more warmth near its body (making it look even more like a fat little hen). It is 10 degrees now and was -6 this morning. All the European Starlings in North America descended from 100 birds set loose in New York’s Central Park in the early 1890s. The birds were intentionally released by a group who wanted America to have all the birds that Shakespeare ever mentioned. Now there are 200 million all across North America! 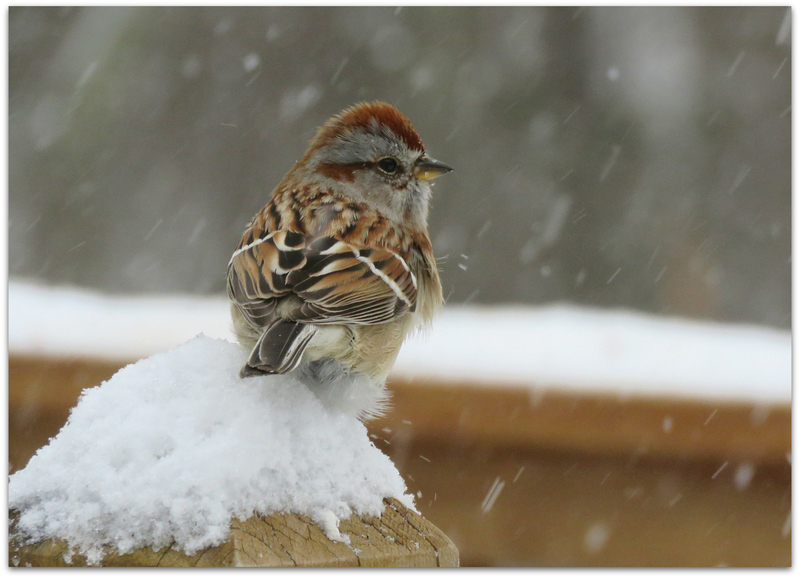 Clearly, the Bard abided birds—his works include references to more than 600 avian species. A Bronx resident, drug manufacturer Eugene Schieffelin (a street bearing his name isn’t far from my house) seems to be particularly responsible for the starlings’ arrival here. Well, his chickens have come home to roost. Starlings forage in lawns, fields, and other open areas with short vegetation. They wander over the ground, often quite rapidly, poking their closed bill into the ground and using their strong jaw muscles to force open the bill and search for soil insects and other invertebrates. 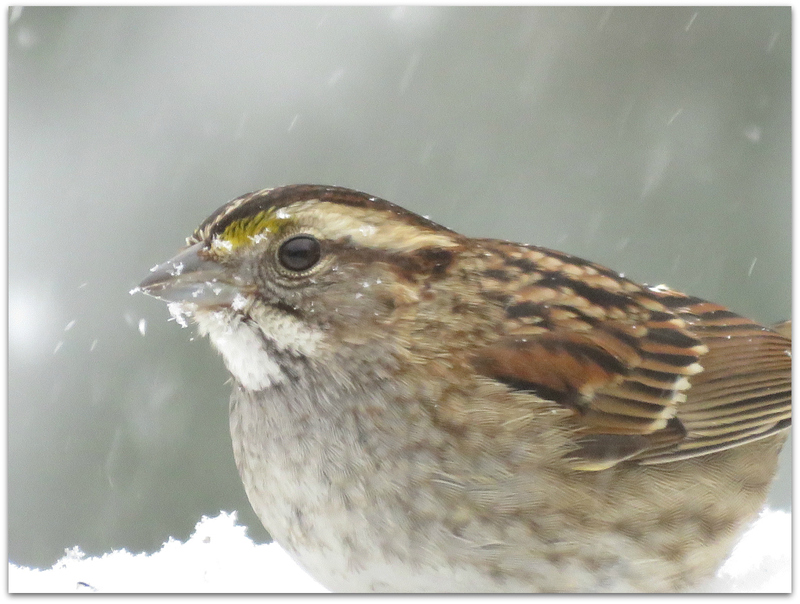 They often forage with other species, including grackles, cowbirds, blackbirds, House Sparrows, Rock Pigeons, American Robins, and American Crows. 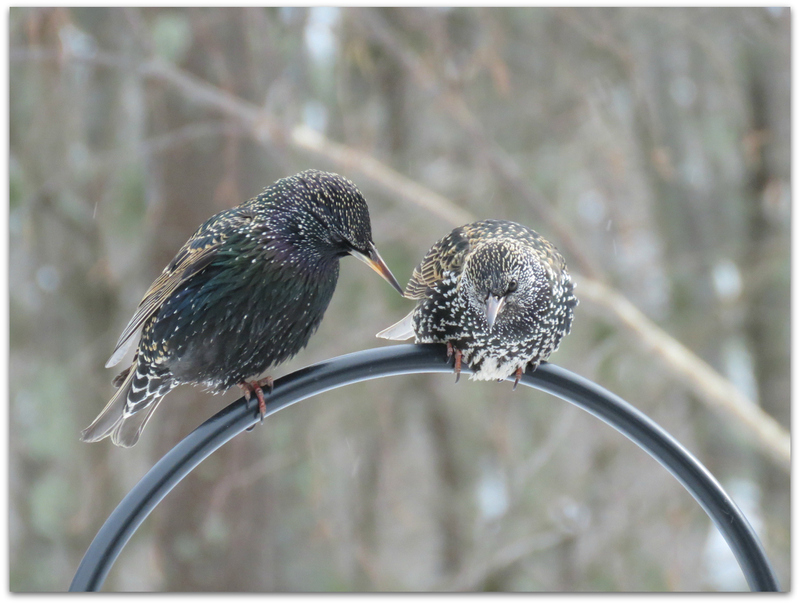 Watching starlings in flocks can reveal several ways that these gregarious birds communicate with their neighbors. 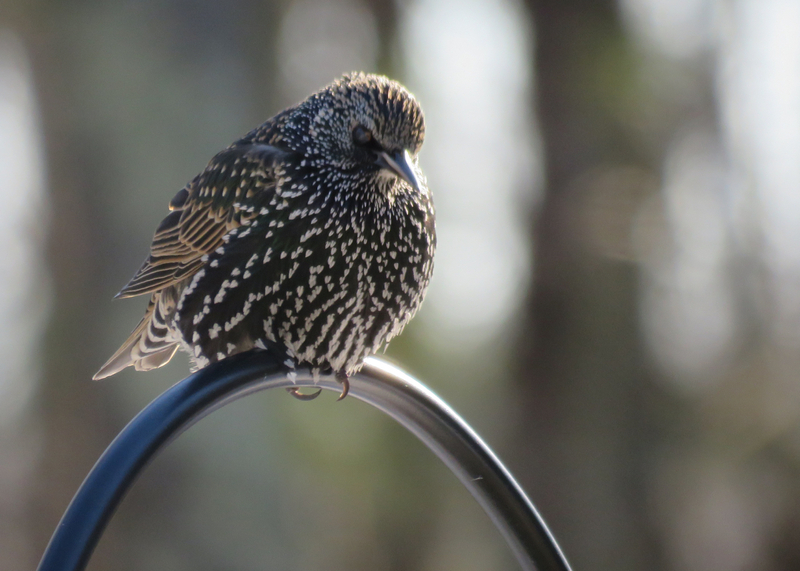 Starlings signal agitation by flicking their wings, or by staring at their opponents while standing erect, fluffing their feathers, and raising the feathers of the head. Submissive birds crouch and move away with their feathers sleeked. Confrontations can escalate into birds charging at each other and stabbing with their long bills. 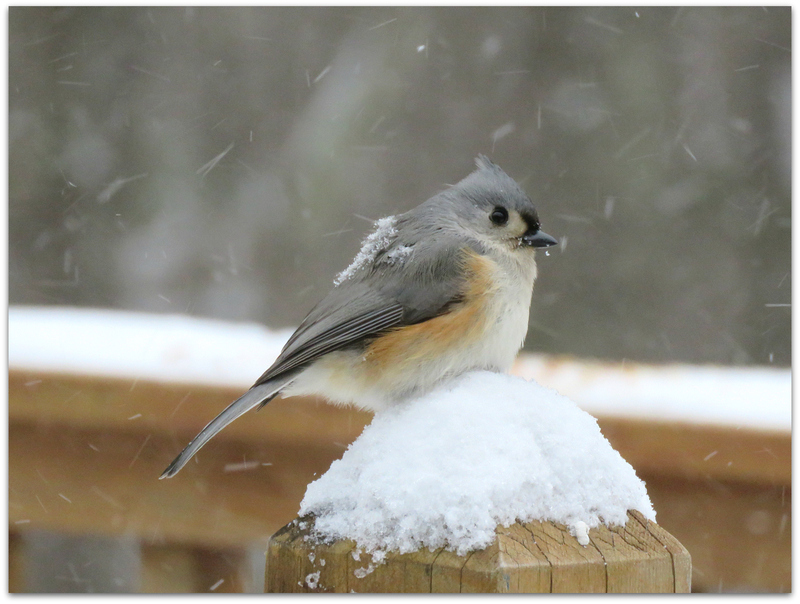 Birds on wires may push others away by sidling along the perch until they’ve run out of room. 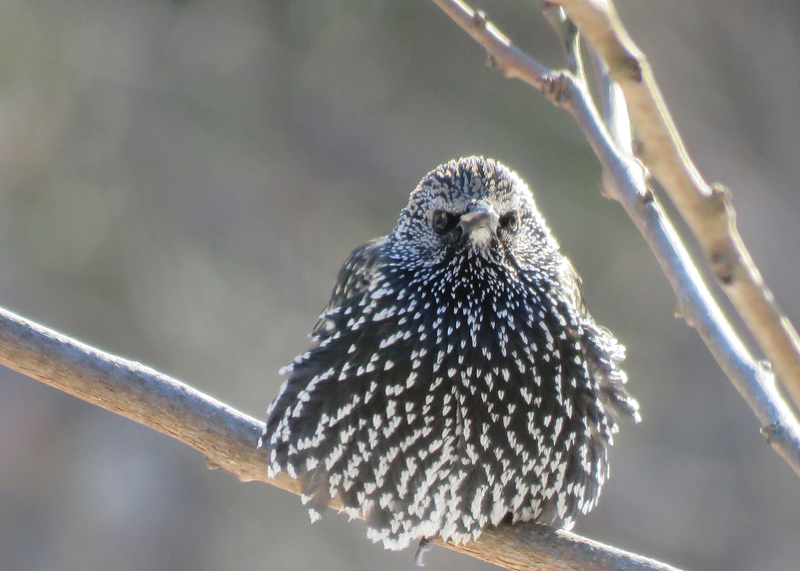 This bird seemed alone – no other starlings. 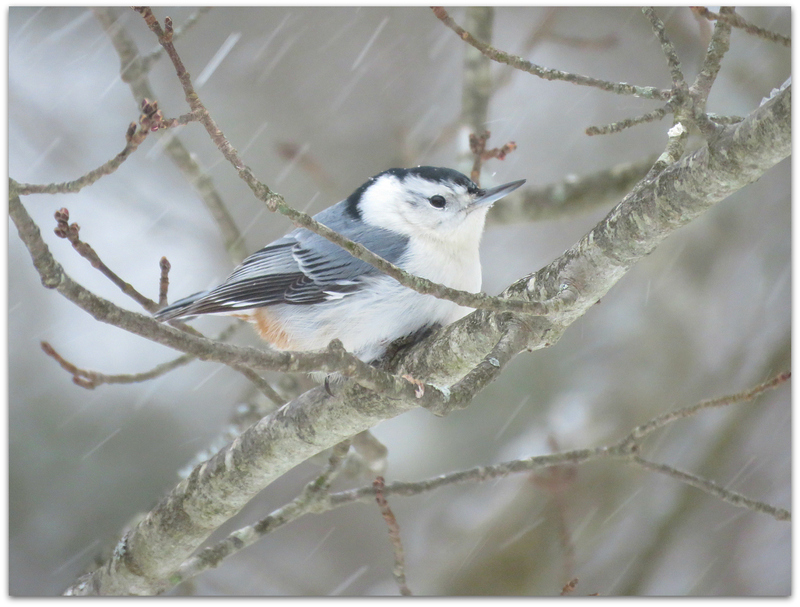 Plenty of other birds around, though: chickadees, titmice, bluebirds, blue jays, downy and red-bellied woodpeckers, nuthatches, mourning doves, cardinals, tree sparrows, juncos, goldfinches. 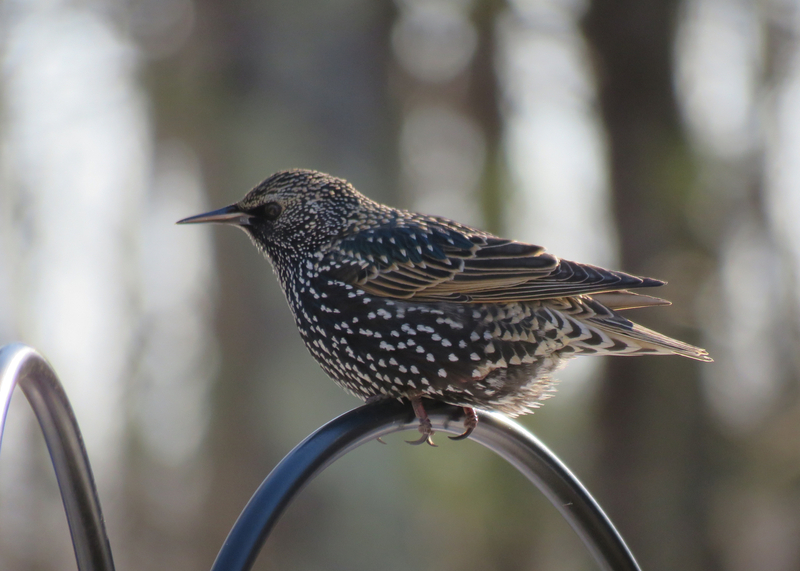 This entry was posted in Uncategorized and tagged birds, European Starling on January 8, 2015 by Amy.